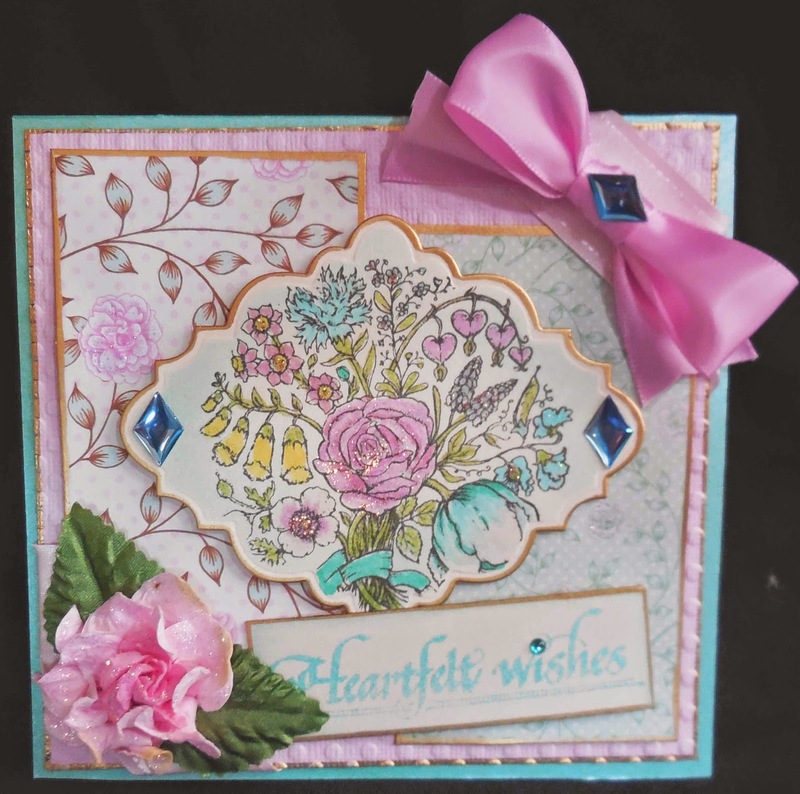 I made this pretty pastel card for the challenge on Power Poppy's blog and The Shabby Tea Room challenge. I used the pretty bouquet from Power Poppy's Springtime collection stamp set. I cut out the shape with a Sue Wilson die and edged in gold with some tumbled glass distress ink. I colored the images with copics and added stickles which don't show in the picture. The leaves, and flower are prima from Michaels. I added ribbon and gems and the sentiment is an old stamp from toomuchfun stamps. I added stickles to the flower at the bottom also. Your card is absolutely gorgeous Karen! Love those flowers and the gold edge! I can see the stickels when I zoom on the picture! Happy New year! Love the die cut you chose to frame your beautifully colored image and my heart is aflutter with that beautiful gold edging! Beautifully done...such soft and pretty elements!! Thank you for joining us at "The Shabby Tea Room" for our "Shabby Chic Holiday"! Happy New Year Karen! These are my favorite colors, your card is simply beautiful! Oh, how lovely to see this beautiful stamp in use again! So pretty how you sparkled it up and added the gems and the matching rose in the corner. I actually have this set on my table, with a card in the works, but haven't found time to sit and finish it. Tomorrow, maybe. Happy new year, Karen! So pretty and spring like Karen! I just pulled this stamp out again the other day for a card this week :) Thanks for playing along with us at Power Poppy! Karen this is so pretty and feminine. Great ribbon bow. Thanks for playing in our Peep Of The Week!